There are many pantry pests which can infest homes and businesses. Though Meal Moths, Grain Beetles and Flour Beetles are very common, Weevils are just as likely to be the unwanted insect in such areas. Weevils are small and easy to kill, but they can complete their life cycle quickly. Adult females will start laying eggs almost immediately so once you have some activity in a structure, it is sure to blossom into a problem which will need attention. 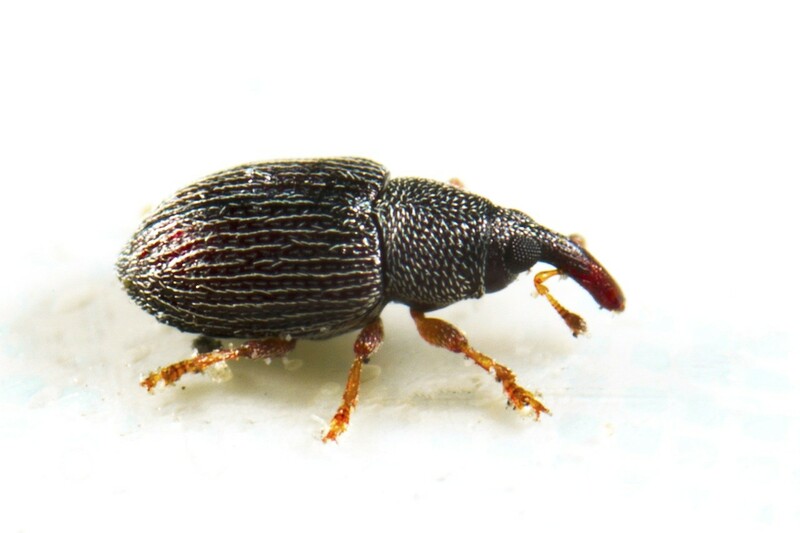 Found throughout the world, Weevils are a pest which can be controlled like many other pantry pests. Find the route of entry, discard infested food or belongings and treat with both residual insecticides and traps. Weevils are a small insect, about 1/16 to 1/8 of an inch long. They are mostly brown to black in color and can have spots on their thorax and abdomen. Weevils can be found eating just about anything in the home. More common food stuff they like include seeds of all types, dried beans, cotton, nuts, cereal, any wheat product, corn, flour, pasta, bread and other grain products found in any home. But their tastes don’t end in the pantry. Weevils will readily feed on cotton fabric found in furniture and clothing. Since they love dried flowers and plants, decorative ornaments found in the home such are wreathes and dried flower arrangements can harbor and feed local populations. It is not uncommon to find them living in or on Christmas ornaments, dried flower collections and stored clothing. Furthermore, adults love apples, pears, grapes and other fruits found in and around homes. Weevils start their life as a small caterpillar like larva which hatches on some type of food like rice, seed or nut. Eggs will hatch within a couple of days of being laid and feed immediately. Feeding will occur for 1-3 weeks and then larva will spin a cocoon in which they will pupate to an adult. Pupation takes about 1 week at which time adults will emerge. Weevils present more of a nuisance than some other pantry pests because adults feed just as much as their larva preferring a wider range of things to eat. Since adults fly well and are small, rice weevils can move throughout the home easily finding all kinds of things to eat. Adult females wills start laying eggs within 3 days of emerging from their pupa cocoons. Most will lay 300-600 eggs during their 3-6 month life span. Since rice weevils can grow from egg to egg laying adult in less than one month, they can be a formidable foe in and around the home. 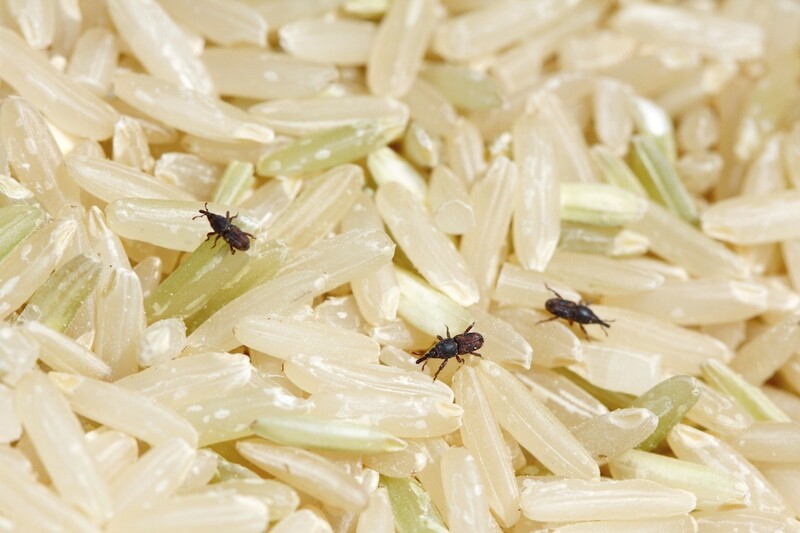 If you suspect you have rice weevil activity, there are several things you must do to knock out current activity and insure new populations won’t quickly emerge. First, empty all cabinets, shelves and closets where they have been seen or thought to exist. Any food stuff which has them active must be discarded in sealed plastic bags. This will help contain them until the garbage is picked up. If you are not sure if something has activity, store it in a plastic bag and check it once a week. If there are weevils in it they will try to get out within a few weeks. If any are found, throw the item away immediately. Since this pest is temperature tolerant, don’t waste your time trying to freeze adults, eggs or larva. Though you can certainly kill some of them by freezing, you’ll need to keep the material stored in sub zero temps for a week or two to have a significant impact. The average refrigerator/freezer found in most homes gets down to just 20-25 degrees Fahrenheit. In other words, they aren’t nearly cold enough to provide a fast and complete kill. Plus, do you really want to be feeding your family something that’s laced with dead rice weevils? Probably not. In most cases, it’s best to discard anything found to have live activity. This insures you won’t be feeding family members a mouthful of bugs. Once the infested product is discarded, you’re just about ready to treat. We always suggest that you first vacuum of all the closets, shelves, cupboards, pantries and baseboards about to be sprayed. This definitely will remove eggs which are too small for the eye to see. Weevils lay eggs with a glue like excretion which helps to attach them to surfaces where food is likely to be available. This helps to keep them but a thorough vacuuming should help to remove some. Once prepared, the first product well suite for this are is an aerosol. DFORCE AEROSOL is a fast acting spray ideal for use when you know where nests might be located. It includes a straw attachment which makes it ideal for applying to cracks and crevices where both adults and larva like to reside. Dforce kills target pests immediately and treatments can last 2-4 weeks. One can will be enough to treat the average pantry and kitchen cabinets several times. If you’re unsure where the nests might be, go with PHANTOM AEROSOL instead. Phantom is non-repellent. Basically this means targeted insects won’t know its present. They’ll readily walk over the treatment and in turn, share it with other insects. Phantom doesn’t kill quickly like D-Force. In fact it will take a good 2-4 days to see results. But this is very much design. So if you have a problem which is wide spread and involves many rooms in the house, use the Phantom instead of D-Force and you’ll get better overall results although it will take a little patience to see the final result. If the problem is extensive and involves the whole house, you’ll be better served spraying with a liquid instead of an aerosol. Liquid sprays can cover large areas more efficiently, are more economical and overall, do a better job. In fact laundry rooms, garages, basements and other areas where pet food and grain products like grass seed are stored are prime locations for Weevils to reside and you’ve been finding them in other areas, you’ll need to more than just treating the kitchen. A good liquid concentrate for the rest of the home is DEFENSE SC. Its odorless, long lasting and can be sprayed on furniture, carpeting and baseboards. Mix .35 to .75 oz per gallon of water and apply the gallon over 1,000 sq/ft. To insure you get all the key areas, add GENTROL to the tank mix. Gentrol is a juvenile growth regulator and will work on eggs and larvae. Basically it prevents the larvae from maturing properly so they die before they reach maturity and reproduce. Gentrol will outlast Defense so you can effectively extend the length of residual and help insure faster success with less treatments needed. The other big advantage using Gentrol is that it will translocate from where its applied. So if you spray the baseboards with Defense and Gentrol, the Gentrol will actually “move around” and end up being active on the ceiling and far into the room. Since its just a protein, it can’t hurt people or pets (remember, it doesn’t actually kill anything). But this translocating action insures a bigger area is protected which in turn insures you get any hatching eggs otherwise missed by the Defense alone. Gentrol can be added to the tank mix with the Defense and applied at the same time. Use 1 oz per gallon per 1,000 sq/ft too. When spraying, focus the application on baseboards, moldings, carpeting, the bottom side of fabric covered furniture and area rugs. Use a good PUMP SPRAYER to do the application. It needs to have a wide spraying “swath” that distributes the mixture equally and smooth without mess or waste. Lastly, install WEEVIL PHEROMONE TRAPS in treated cabinets and pantries. These small, triangular traps rely on a scented oil you add to the catch tray. They fit nicely in the back corners of the cabinet and once in place, will trap entering weevils who are attracted to the pheromone and food smell lure. Place one trap per cabinet and inspect them once a week. Any cabinet or area which has a trap that keeps catching weevils after 2 weeks following the initial treatment should be treated again. Continuing activity is a sure sign you missed something important and need to retreat. For open areas along baseboards and under furniture, install some XLURE TRAPS. This trap has a protective cover on it making it ideal for sensitive areas where pets or children might be present. Xlure contains powerful food and pheromone attractants that appeal to a wide range of other insects too like cigarette beetles, confused flour beetles and drug store beetles. Weevils can be a persistent pest once established in the home. To break their life cycle, you will need to remove their food supply. Next, you’ll want to clean and vacuum all cabinets or closets where activity has been seen. Treat cabinets with Dforce Aerosol to kill hatching larva and migrating adults. Dforce will provide several weeks of protection should any new eggs hatch or if any new adults come into the area. If you’re not sure where the main problem is centered, use Phantom aerosol instead. For large scale problems, spray the rest of the home with Defense and Gentrol. Finally, set some Pheromone based traps in cabinets and pantries where activity has been noted. Be sure to keep the traps fresh so they are always helping by catching adults before they mate and try to reproduce. This program will help to break the cycle so that it will eventually run it’s course and disappear. How do you treat weevils in a shed or warehouse filled with maize grain bags. Where the maize is already affected but can not be discarded and needed to feed people? The most common products used are a straight Pyrethrin or Exempt IC (which is made mostly from food and plant actives). Both are labeled for use in food processing plants with the only restriction being that you must “cover” the food. Since the grain is stored in bags, technically it’s already covered (the label is mostly referring to open bins of grain and other food). We still recommend placing a tarp over the bags to insure there is no contamination. In fact there are many common pantry pests which can readily move onto and eventually nest on fabric. And this list is growing every day. Mostly due to the fact that “eco friendly” manufacturing processes are now incorporating many types of organic and food grade ingredients, materials used for furniture, decorations and clothing can many times have a substantial amount of what these pests consider to be “food”. Naked to the eye, these components will both lure and feed fast eating larvae. Because of this change in manufacturing, we’re finding the range of pests which infest clothing and fabric has expanded to include many more household insects including weevils. Fortunately they’re easy to treat. To both protect and sanitize any fabric or furniture which is showing unwanted activity such as foraging weevils, lightly mist it down with some PT-Microcare or Permethrin. The Microcare is a ready to spray aerosol and ideally designed for small areas and needs. It’s fine for use on fabric, furniture and basically anything weevils might target. It won’t stain or discolor the fabric and when used properly, won’t be noticeable. Permethrin comes in a liquid concentrate you’ll need to mix with water to spray. It will last longer compared to the Microcare, be a liquid compared to the aerosol form of the Microcare and will cover a lot more of an area too. Better suited for large areas, the Permethrin will work on the young and adult weevils and since it has a residual that can last 3-4 weeks, it will provide long term protection to prevent any damage happening from hatching eggs. 3 days ago I found weevils in my dog’s food kept in the garage on the 1st floor. However, I first noticed them in my bedroom on the 2nd floor. They seem to like the sunny areas on the carpet. How can they get up there and how do they survive? We never eat food on the 2nd floor of our home. I’ve cleaned out my cupboards and have tossed everything. What can I do to keep them out of my bedroom and why are they going there? There are many pests that will eat pet food and forage through a home. And trying to determine why this might happen can be a tough task. Remember, carpets and furniture routinely contain natural fabric and common weevils and beetles can thrive on this fabric. This can make the entire home a food supply for any that leave the original infested area like a pantry or cupboard. To stop the behavior, you’ll need to treat the carpet with the Permethrin we have listed in our article. Commonly used for fleas, Permethrin is odorless and can be applied to the carpets and furniture safely. Broadcast it out over the carpet at the rate of 1 gallon per 800 sq/ft and let it dry for at least 2 hours before walking over it. This will help eliminate the carpet as a nest site as well as kill any migrating over it. Additionally, you should set out some of the Traps in the cupboards and pantry areas where they were first found. Next, treat all the cracks and crevices in any room with some Dforce Aerosol. It comes with a handy straw for injecting it where weevils like to hide. Weevils are migratory and when the home has a lot of food options, they can easily start nesting anywhere so it’s important you treat all possible nest sites if you want them gone. Currently I am having an issue with rice weevils which have infested my rice bags. These bags are currently being stored within one of my bedrooms and one bag in the kitchen. After several days I noticed increasing activity of these bugs as they became more and more noticeable within the bedroom crawling all over the mattress and pillows. As for downstairs, I haven’t noticed any activity as of yet which is great news. I am concerned as to whether I should dispose of the rice or treat it as I have stored quite a large amount. I would also like to seek guidance on how I should approach the problem so that I can quarantine it. Whether you want to discard the rice or save it is up to you as this is a personal decision. We have customers who take drastic action and will discard any food stuff immediately upon finding even one random insect. But in fact most all products like rice, flour, cereals and other grains are legally able to have a certain amount of insects included in their packaging. This is something most any manufacturing plant tries to avoid as it won’t help the sale of their product but it is legally acceptable for some such contaminants to exist. Now for obvious reasons, most people cringe at the thought of keeping any food item that contains insects. Personally I remember one time where this same pest made my day a bit unsettled. As I commonly did back then, I started my day bright and early with a bowl of granola cereal which unbeknownst to me was infested with rice weevils. I added some milk and consumed several mouthfuls before I glanced down long enough to notice a very consistently shaped bunch of specs floating around on the surface of the milk in my bowl. Looking more carefully at them revealed in fact they were insects and suffice to say, I quickly lost my appetite! But did anything “bad” happen? No. So in your case, if only 1-2 bags of the rice is infected, the remaining amounts could very well be salvaged. But going through the storage is something you’ll have to do in order to pass judgement on what to keep and what to discard. And in this process, control measures should definitely be employed to both contain the problem and possibly even eliminate it altogether. So here’s what I recommend. First, as the rice is inspected, it should be removed from the room. Once the room is empty, it should be thoroughly vacuumed. Next, it should be sprayed with the Permethrin 10 listed above. Putting down a solid residual will put in place a residual that will control any weevils that try to forage around the room. This will in turn help prevent any further spreading of this pest. And the best way to spray the room will be to spray all the baseboards and flooring using a fan type pattern. Apply 1 gallon of finished product for every 800 sq/ft. So if you the room is 10×20, you’d have 200 sq/ft to treat which means you’ll only need about 1 quart of finished product. This treatment should be done on a regular basis. Ideally, every 30-45 days to insure no future problems in the room. Next, any rice you find infested should be discarded and this includes promptly removing it from the structure. This way the contaminated food stuff can’t “leak” weevils to other parts of the home. And after the rice is returned to the storage area, you should install some ProStrips. These strips contain slow releasing actives which act as a fumigant on nuisance pests. Commonly used in closets and pantries, they can be deployed in any room where people don’t reside for more than 4 hours a day. So if there is no one using this room most of the time, setting out some Pest Strips would be a great defense to both control and prevent any insect pests from getting into your rice. And there is no need to worry about contaminating the rice with these strips; they don’t provide any residual so as soon as the rice is removed from the room, it will be free of the product and safe to consume. The Pro Strips are a great way to protect food items being stored in cupboards, closets, pantries and any room used for storage that has had a history of insect activity. For three summers in a row, my house is covered with bean weevils. I spend considerable time sweeping them up and ousting them. They are not originating inside the house, but I fear they will lay eggs inside. All grains, flours, fruit, etc. are locked up tight and clean. I suspect they are laying eggs in the gardens around the house. You can treat. There are two options that should be employed to stop this from happening. The first would be to protect the home. Spraying as much of the outside siding with Cypermethrin will put in place a protective barrier on which the weevils cannot rest or nest. Treatments would last 4-6 weeks and should be renewed throughout the weevil’s active season. Use a standard Pump Sprayer or Hose End Sprayer to apply it and expect to use 3-4 gallons to treat the exterior adequately. The second option is to target the weevils where they’re nesting. Edible plants can host all kinds of weevils so treat plants suspected of weevil activity with Organic Multi Purpose Insect Killer. This product is approved for organic gardening and won’t pose a hazard to people or the vegetables but will take care of nuisance pests. My son brought a bag of corn feed into his room and the weevils started coming out of the bags. We removed the bag of feed and sprayed with black flag and raid. Is there any other thing else we can use? I have found them all over my house. You really need to treat with the Permethrin listed in our article above if you’re seeing them throughout the home. This treatment will provide the kind of residual you need and will work a lot better compared to any aerosol. I also suggest you set out some Weevil Traps to help catch and monitor any activity the spray misses. We got weevils in our pantry from a bag of gabanzo beans that was just 1-2 wks old! We threw almost everything out, but did keep a few things like canned goods and inspected other items and have them in containers now just in case. We cleaned it thoroughly per your and other sites instructions and haven’t put anything back in the pantry. We haven’t seen any weevils there in a few days but I have found one in our dining room (next to kitchen where pantry is) and living room (also next to kitchen). We have a 14 mos old girl that crawls and walks all over and haven’t considered sprays or insecticides. Is there anything safe to use with a baby??? Thanks! I suggest that you at least set out some Weevil Traps. These can be placed where your child can’t get to them but because of the lure these traps have, any weevils close by will naturally get curious find even the most “out of the way” trap placement. These will no doubt help you to at least locate any focal point where a problem might still exist that needs further attention. Now if you end up catching 5 or more in any one trap, you should consider doing some kind of treating. 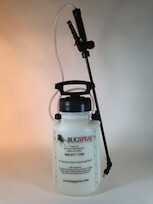 And one of the safest sprays we have is an all natural product most commonly used for Bed Bugs. It uses diatomaceous earth, cinnamon oil and other natural ingredients as actives so it poses no hazard to people or pets. Now even though it doesn’t say weevils on it’s label, I’m 100% sure it will handle them so if you have to use something, this would be the way to go for treating baseboards, carpets, etc. Great. Thank you. I will try these options. After returning from vacation we started to notice these little brown bugs randomly around the house, some dead, some alive. After researching them on the internet, I have determined that they are weevils. I don’t know where they are coming from. I have thrown out anything in the pantry that they could possibly have gotten into. I really don’t think that’s where they’re coming from though. I have seen very few of them in the kitchen and those were walking across the floor, not in the cabinets. They are mostly in our living areas, which are connected to our front and back doors. I have noticed them on the outside of the window in both of these areas. Could these be acorn weevils? We have a lot of oak trees. I really feel they are coming from outside, but why would they be coming in the house and how do I get rid of them? I would appreciate any advice you could give. We need to see one of these to know for sure what you have. A close up photo might help so you can try sending us one. But ideally if can mail us a sample or get a pest id from a local pest control company or extension agent. Service companies will do this free of charge as will any local county extension office entomologist. Once we know what this pest is, we’ll be able to best advise on how to get rid of them. Came home after being gone for 21 days to little brown moths all in my pantry. Lots of them . Are these weevils? Can’t even open the pantry door. Help me please. Sounds like Meal Moths. Read our article on this pest to better acquaint yourself with them. For now, vacuum out any of the adult moths you see. Next, try to find the infested food item that must be in the pantry and discard it. Lastly, get the Moth Traps and Dforce Aerosol listed in our article and treat as explained. Help!! I am manufacturing wheat bags and have just found weavles inside a bag of wheat I was going to use. What is the best way to treat the wheat before I start filling the wheat bags? There are only a few products listed for food items in wheat plants and the best one is Evergreen Pyrethrin. It can be sprayed or misted over the product and will knock out any pest found in wheat. I desperately need your advise! I’m so tired of throwing out bags of rice, flour or cereals when ever I find a weevel in them. I feel guilty about the waste but am disgusted at the site of the bugs in my food products and even more disgusted when I realize I might have eaten some. lol My husband is from Africa and tells me that weevels are common there and not considered disgusting if you happen too eat one or two or three or four. lol He makes me feel guilty for throwing away food and not having the stomach to finish a meal after the weevels have been spotted. lol What I want to know is if I eat them can I get sick and do they pass any disease or germs such as roaches? I had never heard of weevel free products till I read your site. Where can they be purchased? And can weevels still reenter those packages if say the pantry has weevels? Also where can the sprays and traps to kill them be purchased? Please help!!! Thank you. @Cece: Weevils aren’t what we consider to be a “dirty” insect so there is no need to worry about ingesting a few. They tend to spend their time in or on food and in all the cases I’ve heard where people have eaten some by mistake, in no case did it cause a problem. As for how to get “weevil free”? That can be accomplished by following the guidelines outlined in our article above. First, remove everything from your pantry. Next, discard anything you suspect could be harboring weevils. Next, vacuum the pantry thoroughly and then give it a good treatment with Dforce Aerosol. After letting the treatment settle for an hour or two, you can restock it with your stored food items. Lastly, set out some Weevil Traps to help collect any weevils your treatment missed. These traps will also help you to monitor the problem so you can determine if it’s getting better, worse, etc. If you follow this regime, you should be able to solve this matter in a few weeks. What is the life span of them? I’m finding them dead prior to treating the problem. Now if you’re finding them dead around a cabinet or in one room, treating all the cracks and crevices with some Dforce or Phantom aerosol would be the recommended method of treatment to treat. This will insure the foraging adults are not able to lay eggs which will prosper elsewhere in the home if you allow them free access. Adults will die after mating and laying eggs and if you’re finding dead adults, there is a good chance they’re expanding their territory. But if you’re finding them distributed throughout the home, treat instead with some Permethrin. It’s a concentrate (not an aerosol like the Dforce or Phantom) that can be mixed with water and applied using a Pump Sprayer. This will prove more cost efficient when treating larger areas; the aerosols are okay when the area involved is small. I found one in my bedroom and laundry room will I need to throw out my clothes or just wash them? No need to throw anything away but washing would be in order. First, I’d remove any loose laundry, clothes bins, etc. and treat with one of the products I just recommended you use. And the treatment dries (1-2 hours), I’d say to go back to your normal wash routine. This will insure any eggs laid on your clothing will be removed. The key here is getting a good treatment in place because once that’s done, it won’t much matter in the long run if you see any in the laundry room because this will effectively stop them from being able to expand their area. In fact, this treatment could very well knock them out for good. I keep a very clean home and I have not been able to find how the weevils could have possibly invaded my home. I try to keep most foods weevils could invade in the fridge and everything else is in vacuum sealed containers. I live in an apt so is it possible they are migrating to me from someone elses apt? I am now finding them in all rooms and I don’t know how to get rid of them. Is permethrin safe to use on my floors even though I have a crawling baby at home? if not what is safest to use all over the home with a baby around? First and foremost, all our products can be used safely around children and pets when they’re applied properly. So in this case, if you were to limit all your applications to nothing but the Phantom or the Dforce aerosol to cracks and crevices, there will be no active out in the open to present a risk or danger to your child. This would no doubt be the more costly to proceed compared to liquid spraying but if you only have to treat 3-4 rooms, I’m sure 1-2 can’s will do the job and solve the problem. Now if you’d still like to go with the liquid option, either the Perm 10 or the Defense can handle this pest and again, not be a problem for the child. Both are labeled for use on furniture and carpeting too so this means people can touch treated areas without a problem. Just be sure to keep the baby away during the treatment and for a few hours afterwards so the area can dry and everyone will be fine. Lastly, since you’re not sure where they’re coming from, it would be wise to set out 4-6 Xlure Traps. These will quickly attract and capture any weevils you miss with the treatment. These traps can also help because over time, if the weevils are coming in from another apartment, you’ll start to notice 1-2 of the traps catching more weevils than the others. This is sure sign the problem is isolated to one room or even another apartment and in your case, could really help at identifying where to focus your effort. Hey there, I recently found a bag of oatmeal forgotten at the back of the cupboard and it was absolutely full of rice weevils. Unfortunately there are 4 cupboards where I keep everything from rice to cookies and they are all connected to where the bag of weevils was so the pesky bugs infested everything else. I’ve cleaned everything, tossed every open bag, transferred everything to glass containers or thick ziplock bags but there are many weevils hiding on the cracks of every cupboard. I see them walking around but can’t reach them and my fear is that there might be live eggs hiding in the cracks too! My question is about the sprays like Phantom and Permethrin that you guys suggest. I have a 3 and a 5 year old and I need to treat places where we store our food but also I’ve seen weevils on our living room couch. Is it safe to have that applied to the crevices of the couch?!?!? How long after I apply any of the bug sprays can I put my food back into the cupboards and let my kids get back to lying on the couch?!?!? What do you suggest I do?!?!? Which of the sprays should I get, with my kids in mind? Thank you so much! First, the Phantom would be the way to go for the cupboard. Its odorless, goes on dry and will not pose a hazard to people or any of the products you store in the cabinet. The key here is to first make sure you remove everything prior to treating. Next, vacuum the cabinets before treating as well. This will help remove loose food, some of the bugs, etc. Now after you vacuum, apply the Phantom and let it sit for 1-2 hours before putting anything away. Once dry, it won’t be a safety issue as explained in our Aerosol Safety Video. This can be seen at the bottom of the Phantom product page and is well worth watching. Basically it covers all you need to know about how to use our aerosol products safely and effectively. Now the couch is a different story. Phantom is not labeled for broadcast spraying over furniture so I would go for another product we sell which will do the job and not pose a hazard to anyone using the couch. Commonly used for bedbugs, Bedlam Plus is perfect for this application need. Its low in odor, ideal for use on beds, mattresses, couches, etc. and thats because its safe enough for these areas yet effective on many insects including weevils. Just be sure to vacuum the couch (like the cabinets) prior to treating. And just like the Phantom, allow the treatment to dry for a good 1-2 hours before using it. Lastly, be sure to set out some of the Rice Weevil Traps in any room where activity has been noted (as well as the cabinets). Two weeks ago I found a few weevils in our laundry sink in the basement. Then a few days later I found the source where they were coming from: corn bags with holes about 10 feet away from the laundry sink. The past two weeks I have been battling these weevils non stop in our basement. Our basement is mostly used for storage. Am I going to have to move every plastic container, box, etc. and clean everything in and around to get rid of these weevils or will they eventually die off without the food source? Please help! Since it’s not likely you can clean away all the food they might feed upon, there is no reason to waste your time unless a good cleaning is in order. But even if you do clean, the problem will persist unless you treat following one or two of the methods listed above. So at this point I recommend broadcasting 1 gallon of mixed Defense per 800 sq/ft of flooring. This will be important – especially if the area is carpeted. Next, treat any crack or crevice you can find with the Phantom aerosol. This odorless aerosol goes on “dry” and should be used above the flooring where you can’t spray the liquid Defense (because it will be too messy). Lastly, be sure to set out 3-4 Xlure Traps. Thank you for your response! I have been vacuuming and cleaning pretty much every night and there still seems to be live weevils “coming out of the woodwork.” Should I remove all items in the basement (get one of those outside storage containers for the time being) and then spray as suggested? What do these weevils feed off of if the corn bags and no other food is stored in the basement? First, the adult weevils you see don’t eat. All they do is mate and lay eggs. So unless you kill them all, they’ll likely keep the infestation going because all they do when in this last stage is forage around mating and laying eggs. Third, once the larvae eat and go to pupate, they’ll typically hide in any crack or crevice to complete their life cycle. And when ready, they’ll hatch. So since the pupae can be located “anywhere”, it will no doubt appear that they are coming from “the woodwork” because in fact, many are! In summary, this is why you need to treat all locations in any room where you find activity. This way the next phase of hatching larvae will fall victim to your treatments (assuming you’re thorough and complete in your effort). And the added benefit is that these treatments will kill any hatched adults too. Unfortunately you can’t kill eggs or pupae so even after you spray, expect to be seeing more come out for another few weeks till the cycle of hatching pupae runs out. And since it’s imperative to be thorough when treating, removing everything prior to spraying the area will certainly help ensure success. Weevil’s in shower. We have what appears to be weevils in a shower in our home. I had my wife take them to a pest control place and they identified them as weevils but said it does not make sense for them to be in the shower. I just looked through images of them and it sure looks like they are weevils. WHY would we have them in a bathtub/shower? We are having trouble eliminating them. Is there another type of bug that looks like a weevil that makes more sense in a shower? There are so many insects that like to live in the bathroom that it wouldn’t be possible to list them all in this thread. As for why they’re in the bathroom? That’s because the bathroom is an ideal place for most any insect. And there shouldn’t be any surprise why this would be. Think about it. Bathrooms typically have lots of water, high humidity and plenty of food (food in the form of human hair, skin, etc.). There is usually ample nest sites too like inside grout cracks, under tubs or shower pans, under rugs, carpeting or linoleum tiling, behind baseboard molding, around window frames, down drain lines and under toilet seats. On top of the perfect living conditions with ample places to hide, it’s hard to control insects nesting in such environments because traditional treatments won’t last as long as normal. This is due to the high moisture levels found in most any bathroom. So in the end, you’ll need to do extra treatments and they’ll need to more thorough if you want to get control of this weevil problem. So with all that being said, here’s how you can knock these weevils out. First, get some PT-221 aerosol. This product is fast acting and can be used in all the areas listed above. It can even be used down drain lines which could be important. Be sure to use the included straw tube injector to treat every little crack or crevice you can find. This way any weevils hiding or nesting in remote well hidden locations will be killed too. Now if you’re able to apply this material to their main nest sites, you’ll see instant results meaning that you won’t see nearly as many active adults following your treatment. But since eggs and pupae can’t be killed, you’ll need to treat weekly for 3-4 weeks to break the weevil life cycle. The good news is if the treatments are done properly, you should get control of the problem within a month. Just recently I have found weevils in my car. They seem to be in all the little crevices where vacuum pieces just can’t get to. We vacuumed the best that we could but can’t seem to get rid of all of them. Is there anything that I can do? This is an easy one. Get the Phantom aerosol (shown above). Use this by applying some to every crack and crevice you believe they may be using. Phantom is unique in that it goes on dry and is odorless making it perfect for use in cars. Apply it in the morning or at night with the doors open so the cab can dray and aerate for 1-2 hours. After that time the car can be used like normal and within 3-4 days, all the bugs will be dead. The one thing about Phantom is that it doesn’t kill on contact but instead it takes 2-3 days to kill insects but this is by design. The slowness of the active enables it to “spread” to others so it has a much bigger impact when it finally kicks in. Oh no, just accidentally put some weevils into my composting bin!! Will they lay eggs and mess up my beautiful soil to be?? Thank you for your time. Help! They could very well become a problem because they love compost bins. So to knock them out before they get established, spray daily using Multi Purpose Insect Killer. 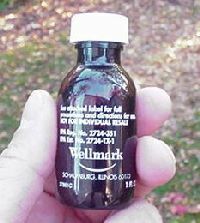 This concentrate is approved for organic gardening and safe for use on vegetables, fruits, etc. yet its still strong enough to control weevils. Depending on the size of the bin, you’ll need to spray a certain amount daily for 7-10 days to insure you’ve killed all of them (let us know the size of the container and we can further advise how much you’ll need to apply when treating). We have a small cabin on our farm that we visit about once a month. We have begun to notice a few weevils on the floor and this weekend when we arrived there were dead ones covering the sticky traps we leave out to catch the mice that get in. We leave chunks of rat poison out in various places around the cabin to control the mice and have done this for years and never seen any weevils until recently. But the poison has a cornmeal base and it appears that the weevils are coming in to eat it. We do not leave any food in the cabin that is not canned or in the refrigerator bc of the rats so they are not here to eat food. What can we use to control the rats and not attract weevils. And how do we get rid of the weevils we now have? As for the weevils; you’ll need to treat using our products above. The best and most thorough way to proceed will be to broadcast the Defense and Gentrol listed above using the mixture rates we recommend. Spray carpets, area rugs, floor mats, baseboards, furniture and any cabinet or closet you think might have activity. Once in place, the spray will kill off hatching larvae that will no doubt be emerging soon since the adult weevils you’ve seen will be laying eggs all over your home. Lastly, get rid of the rodenticide and instead, install our sound repellers or live traps (details are in our mouse control article – link above). And you should also treat with the NNz listed in the article. This will get rid of the mouse scent that’s drawing them to your home too. I have what looks like grain weevils started in my bathroom. Now they are moving through out the house. I have removed all food sources from pantry even though I have not seen any in there. The main area is bathroom. I’ve had pest control come and spray and it’s not working. They said they never seen this before. That usually their in the pantry area. Any info would be greatly appreciated. First, since you can’t kill the eggs or pupae of insects, any treatments done would not end the activity. Basically what was sprayed should kill any developing young and in theory, should kill the active adults that move through the treatment. But pupae hiding in the home will be hatching for many weeks so you should expect to be seeing them for awhile following the initial application. That being said, if the job is done properly using a “non repellent” spray like the Phantom above, the treatment will eventually kill all of the weevils since they will not detect its presence and in turn, move through the treatment and die within a few days. Second, weevils can eat a wide range of food and fabric so they can live in most any part of the home. Regardless of where they might be nesting, a proper treatment using the right product will control them. Now in this case, if they used a repellent type spray, the problem will probably linger and could continues. So at this time, our best suggestion is to get your service company to treat weekly until the problem is gone and you don’t see new weevils moving about. Most important is to make sure they’re using the right material. If they’re spraying repellent type actives, it will only spread the problem since the hatching adults will forage to where they didn’t spray. This will enable them to find new nest sites and in turn continue on with their life cycles. But if Phantom is applied (see it above in our article) throughout the areas where you see activity, you will eventually kill any that are in the home. So if your service company won’t do the treatment with the right material for the job, get some and do it yourself. My service people won’t even come. They’re suppose to refund me my money. They have been using an aerosol spray. You’re right, after they came they got worse. I will be ordering the products you have suggested. If there is anything else, please let know. Thank you. The only other important thing to do is that before our products arrive, it would be smart to use a damp rag or papertowel to “wipe up” any of the product the previous company was spraying. Since its most likely a repellent, we don’t want it to interfere with the spray you get from us. Cleaning the baseboards and any other areas you know they sprayed would be helpful by eliminating the chance of cross contamination. Also the weevils are on the ceiling after they sprayed. They’re moving into my kids bedrooms and starting to come into the kitchen. This is just more “proof” that the spray being used is effectively chasing them around. The good news is the Phantom you ordered can be used to spot treat the ceiling area. Lightly mist it where you see them; it doesn’t take much so there is no need to get treated surfaces wet. Just a quick mist will do and any excess can be wiped away. Treating where you see them won’t kill them quickly but again, this is by design. In 2-3 days, they will all die and during their last hours they’ll be spreading the treatment to others they encounter.